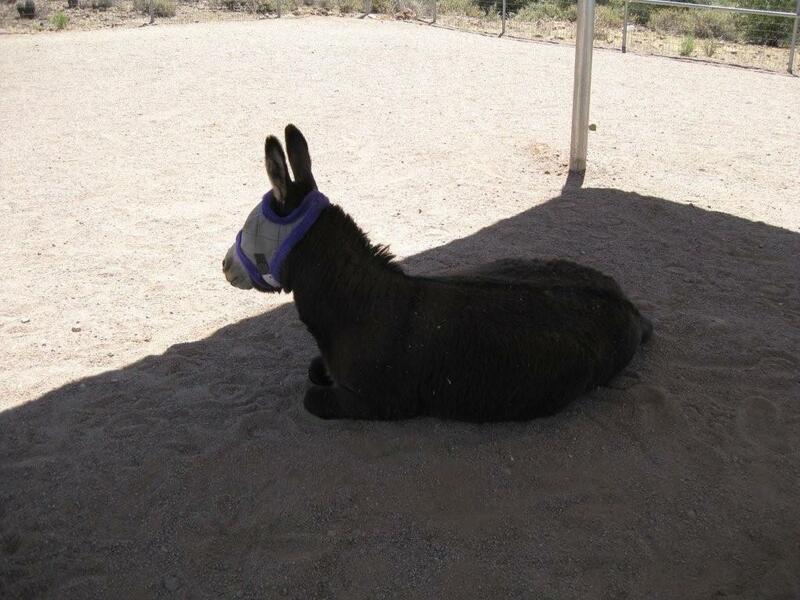 We want the world to know how wonderful donkeys are! 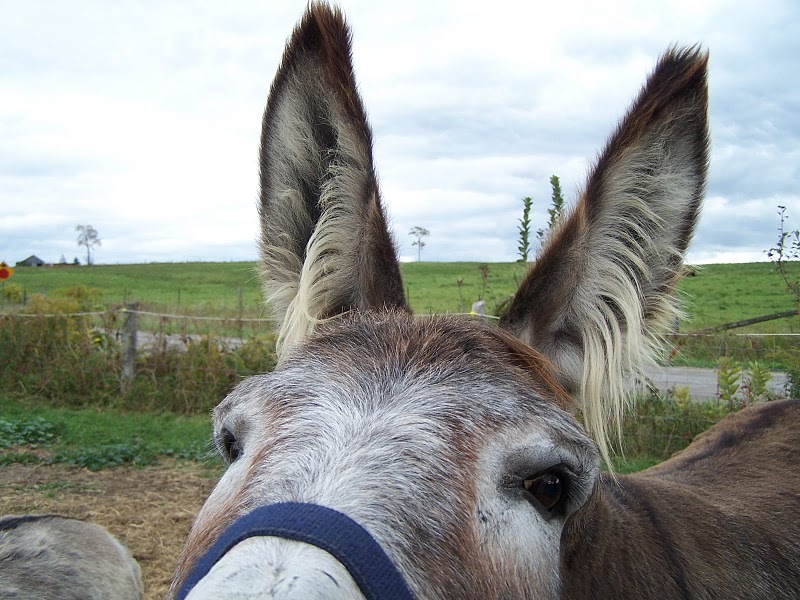 Our hope is that you’ll share your positive stories, experiences and photos of donkeys and burros. Just send them to us at morningbray@hotmail.com and we’ll post them here. I work at our local SPCA and we have a summer camp for kids. 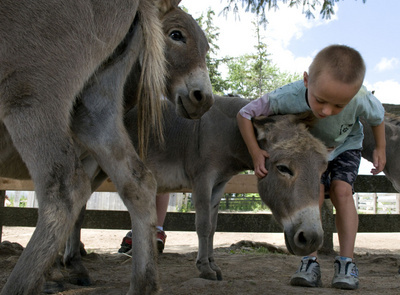 So far this summer, we’ve gone to the Donkey Sanctuary of Canada 3x for our field trip. It is a fantastic place that deserves more recognition. 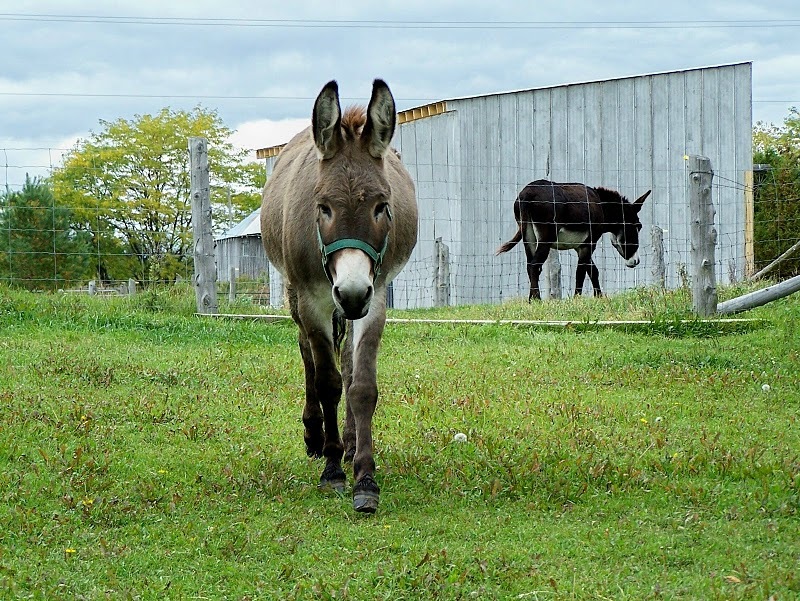 Can you believe Ontario has TWO donkey sanctuaries?!? 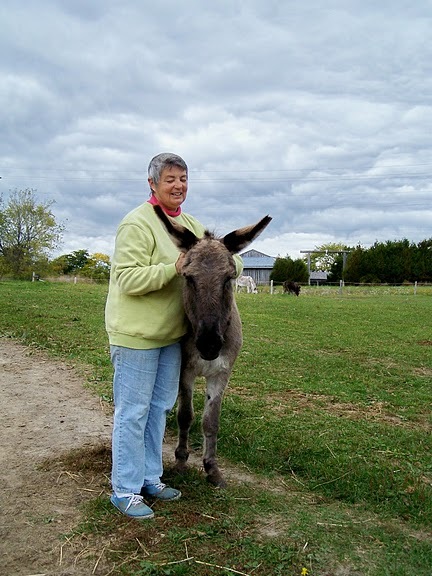 And, since most of you are donkey fans, I’m putting in a plug for a new page I recently started on Facebook: For the Love of Donkeys. 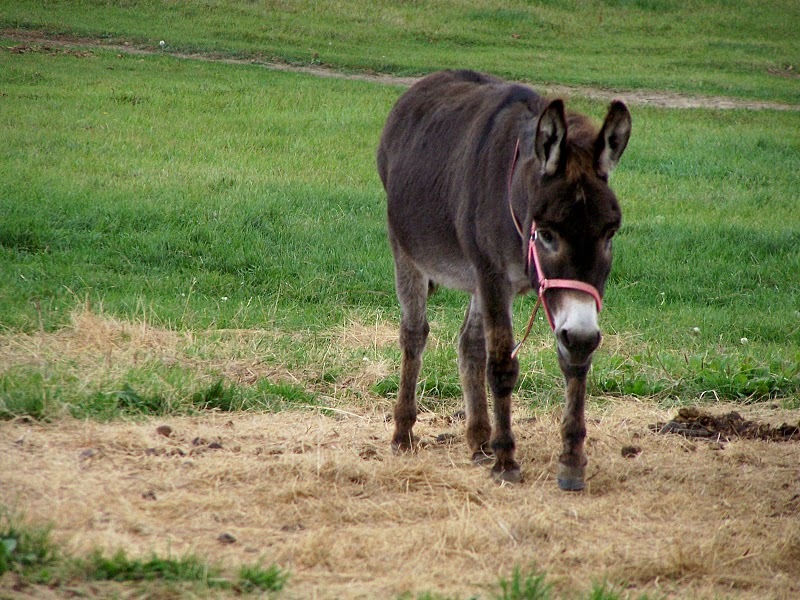 While I began the page as a forum to talk about and bring a stop to the practice of using donkeys as a training tool for roping horses, things are now at a bit of a standstill with our local government. Are you surprised? Thought you’d like to know how the story ends for one of the Donkeys featured in the PrimRose Sanctuary “For the Love of Donkeys” piece. Leon, the Donkey who was turned loose on the road and couldn’t be caught for days because he was so wary of people, has since been adopted. He went to his new forever home last Sunday. I met his new human, who just happens to be a large animal Veterinarian, the day I visited the Sanctuary. She was there meeting Leon, and it was apparent that he really liked her. A couple of days into the adoption she reported that he was doing great, had settled in well, and he and her three Draft Horses were getting nicely used to one another. 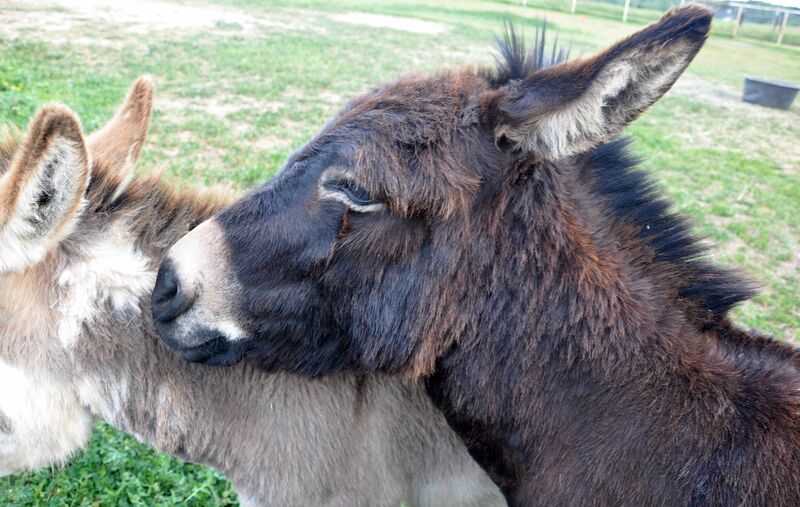 She says he is “very affectionate” with her and she just loves “this sweetheart.” The new Leon, the real Leon, is a far cry from the wary, suspicious Donkey that had to be rescued from the Livestock Auction. Don’t you just LOVE happy endings!? 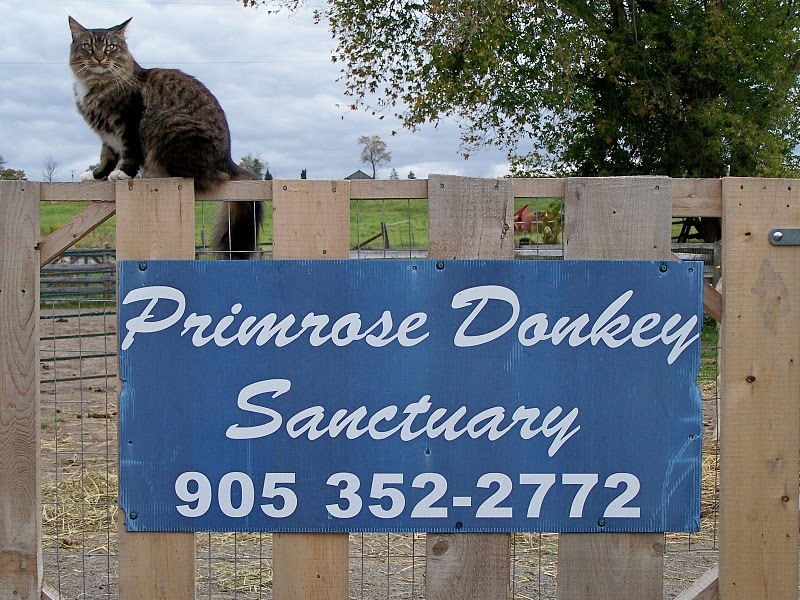 I finally paid a visit to PrimRose Donkey Sanctuary near Roseneath, Ontario last Sunday. Founder/proprietor Sheila Burns introduced me to many of the individual Donkeys, then kindly allowed me to wander at will amongst them with my camera. I must say I have never visited a more peaceful place, nor met so many gentle and trusting creatures. What struck me most was how well they all got along and how well they accepted an unfamiliar person in their midst. 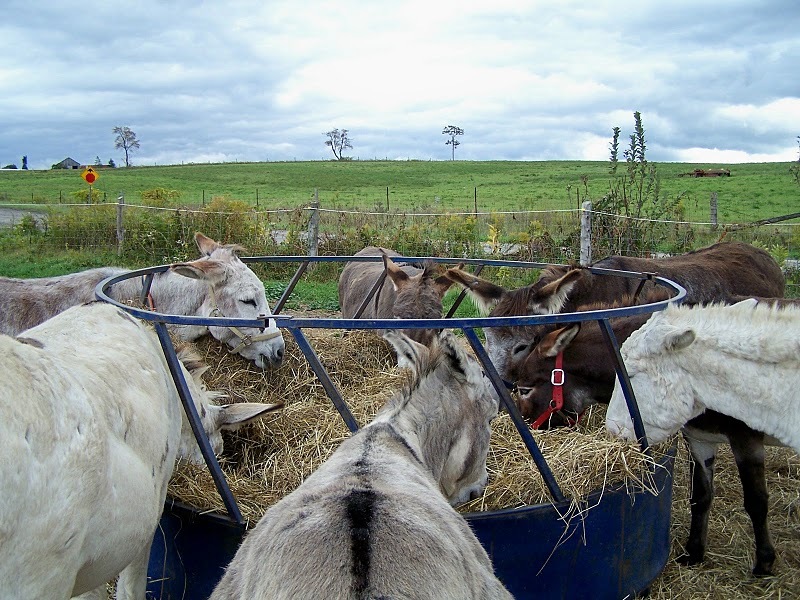 Large groups gathered around the hay feeders and ate companionably, while others paired off for mutual grooming, or dozed in the sun. I didn’t see one single act of aggression or dominance the whole time I was there, nor did any of the group around the hay feeder mind at all when I joined them and poked my camera lens in their faces while they were eating. Considering some of their histories, the calmness and trust they show is indeed a tribute to the care and healing they have received at the Sanctuary. At present there are about twenty equines in residence mostly Donkeys, but also three Mules, and one Pony. They’re all different sizes and ages, and have widely varying life histories, some being rescues from abuse and neglect, others given over when a caring owner was no longer able to care for them, or had passed away. The oldest is Lucy, age 42. Several others are well into their twenties and thirties, including PrimRose herself who is now 34 years old. These seniors and some of the rescued animals will stay at the Sanctuary for the rest of their lives. 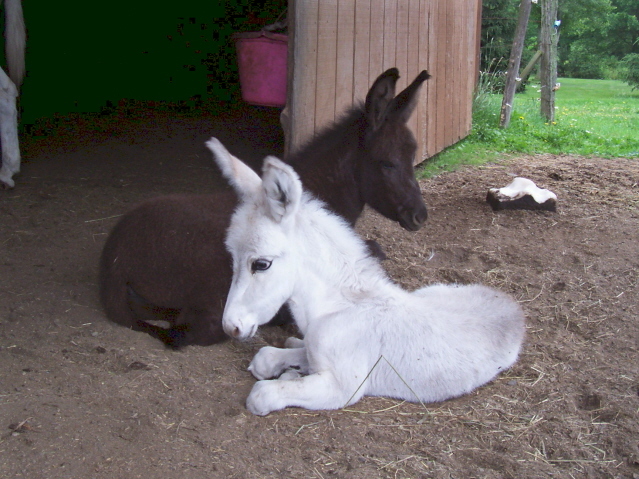 Other younger healthy animals that have not endured traumatic early lives, or that have been physically and emotionally rehabilitated, may be made available for fostering / adoption to carefully chosen individuals subject to terms and conditions to ensure their continued wellbeing, thus making room for newcomers. 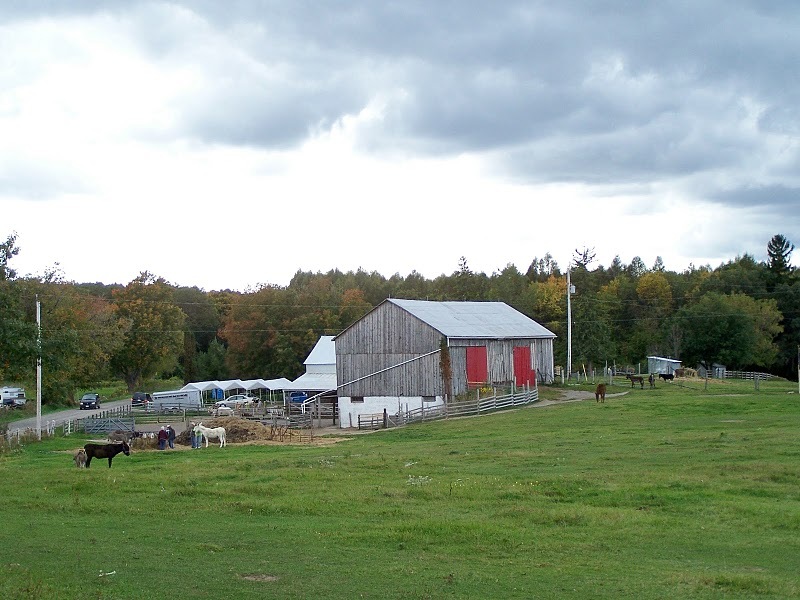 Although PrimRose is officially a Donkey Sanctuary, no needy large animal is ever turned away which is why two Sheep, a Goat, and four Potbellied Pigs also call the farm home. I’m sure Wynonna over at the 7MSN would approve. 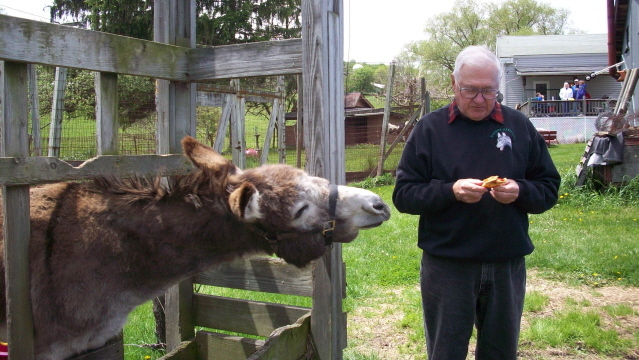 Please invite your Blog Viewers to visit the Sanctuary’s website. There are three Photo Galleries there: Donkeys, Other Animals, and New Faces. Each has photos and brief biographies of several of the Sanctuary residents. (To access each “New Faces” bio you need to click on his/her picture.) There’s also some educational information under the “Donkey 101” tab. As for myself, I’m partial to Annabelle and Leon. 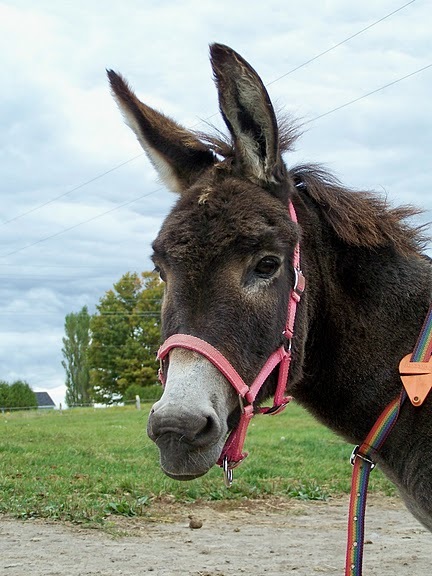 Annabelle in three months has gone from a being a skinny little lice-infested Jennet so bloated with worms as to appear pregnant, to being one of the most beautiful and charming little Donkeys you’d ever want to meet … I dare say as adorable as Bernard, but in a dainty feminine way ! It was very hard to get an in-focus photo of her as she is so people-friendly that she kept coming closer and closer to the camera. 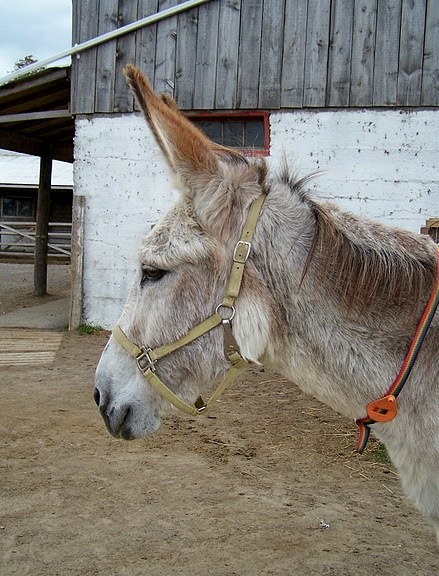 Leon is a handsome young Donkey of 6 years who was caught in the middle of a domestic situation and spitefully turned loose to fend for himself … on a road ! After some time he was caught and held by Animal Control which insisted, when he wasn’t claimed by the owner, that he go to a Livestock (Meat) Auction rather than being sold directly to the Sanctuary. He was in decent body condition but with a severe case of overgrown hooves making it difficult for him to walk. Three months, two farrier visits, and a castration later he is moving freely and ready for adoption. 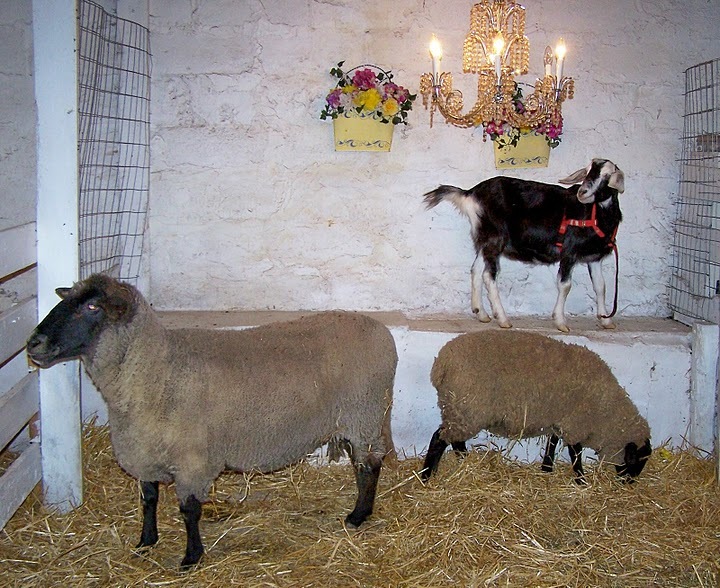 Annabelle, Leon, and the lamb Christina-Rose were all rescued by being purchased at the same auction. And here’s Joey, a longer term resident who had been badly abused but is now happy and friendly, and who has the cutest long ear hair. The latest two rescues, Simon and O’Sullivan of whom you already know from Sheaffer’s Blog, are also pictured. They share a paddock and have become fast friends. O’Sullivan still looks pretty rough, and being quite old will take a long while to recover, but he is on the mend enjoying all the attention and providing fly-swishing services to his new friend Simon who as you know has a broken and immobile tail, but is otherwise in good condition. “It was mostly a helpless feeling of not being able to do a whole lot,” said Colyer. 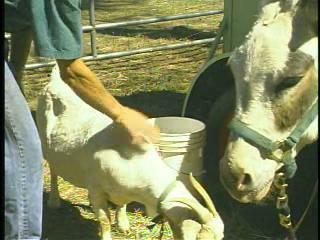 That is when Buttermilk’s best friend, Poppy the donkey came to the rescue. “Suddenly Poppy just started circling the mountain lion and kicking at it with everything she had and repeatedly kicking with front and back legs until he decided it was the wise thing to go and take off. He took off and jumped over the fence,” explained Colyer. Colyer says it looks like the mountain lion got the message loud and clear. He has not been seen around the property since. This week we get to meet Keebler, Mel in N.Y.’s jack. Here’s Keebler begging for snacks. Hi, Mel! In this picture, Keebler is showing off for the girls. And here’s a gorgeous picture of Keebler in the snow. 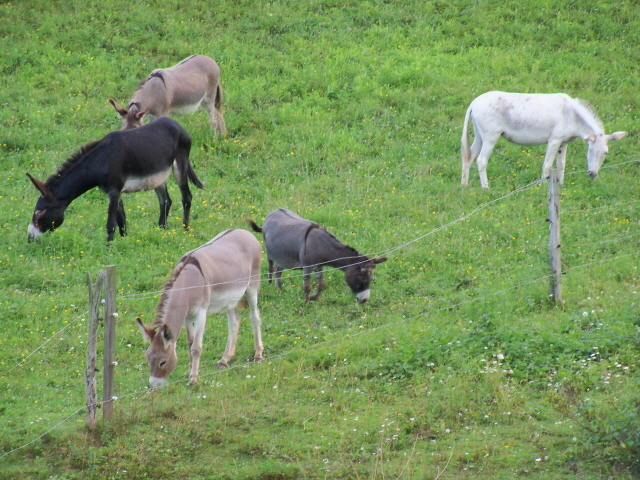 We’ve now officially met all of Mel’s donkeys. He has quite the beautiful herd, doesn’t he? Here’s the rest of Mel in N.Y.’s beautiful herd. Don’t they look so gorgeous in their green pasture? And Mel, we love that you went out and got measurements on each and every one of them! Except for my jack, here’s the rest of my herd. Going clockwise, and starting with the light gray at 11 o’clock. OK, starting with when they arrived here! Bandet, Age 22, Height, 33 inches, been here 20 years, Ear span 22 inches. 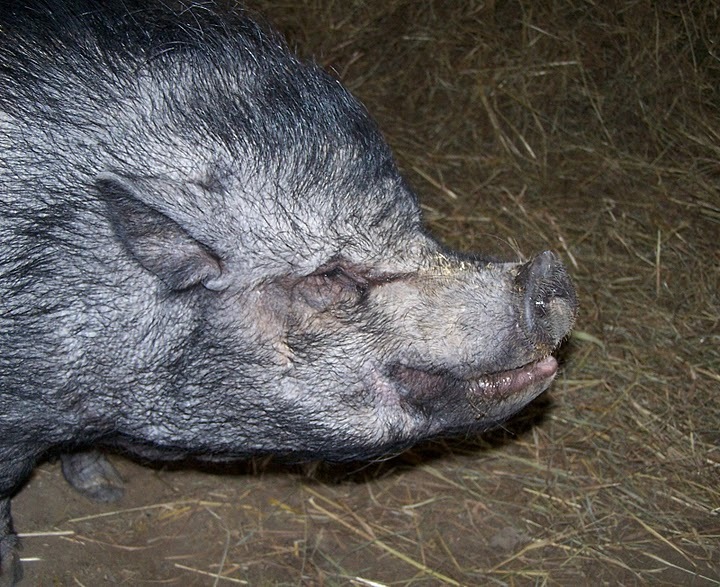 Wilma, Age 16, Height , 46 inches, been here 16 years, ear span, 26 inches. Becky, Age 13, Height, 46/47 inches been here 12 years, ear span, 26 inches. Keebler, Age 12, height, 46/47 inches, been here 11 years, ear span, 26 inches. Sparkle, Age 11, height, 48/49 inches, been here 8 years, ear span, 28 inches. Charleen, age 9, height, 45 inches, born here, ear span, 26 inches. Ann, age 4, height, 47 inches, born here, ear span, 26 inches. Odet, age 4, height 54 inches, got here in March, ear span, 29/30 inches. Toby/Tyler, born May/June, height changes every day! ear span, 21 inches. I measured Tyler at 2 days old at 28 inches. At 2 months he was 34 inches! 6 inches in just 2 months!! I just had to mention “ear span” didn’t I! The things I get my self into! LOL. All measurements are +/- a little bit! 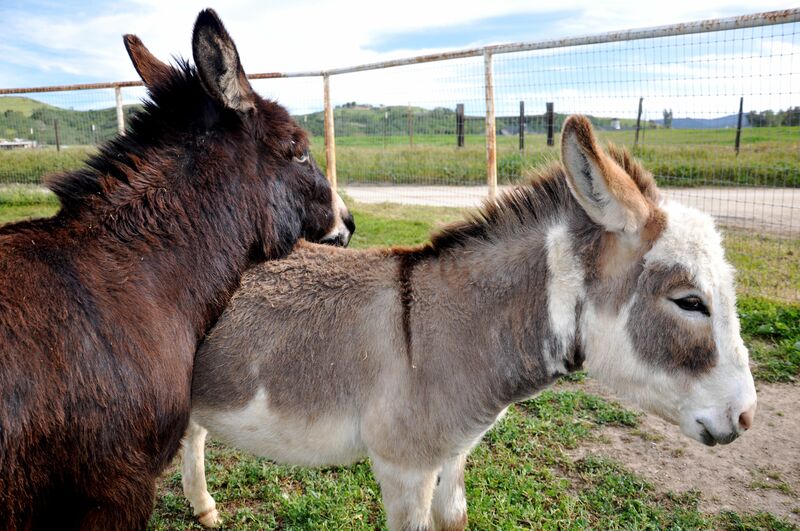 If you think about it, what could be better than getting to meet new donkeys every week? 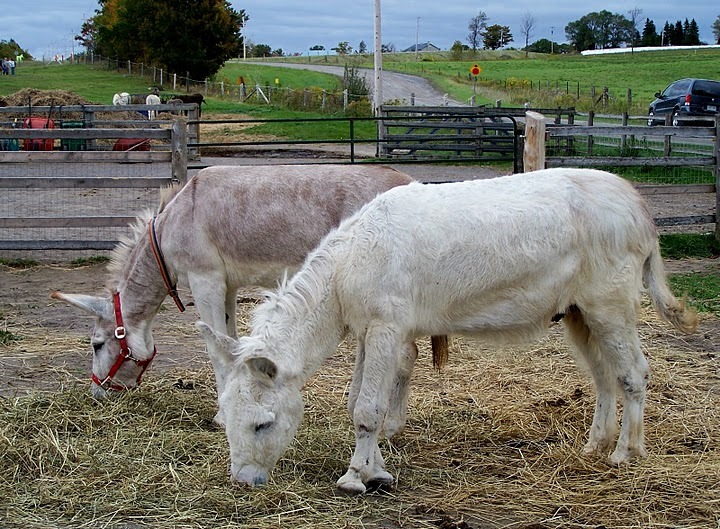 First, thanks to Denise for sharing her mini donkeys – Gunny and Harry – with us. 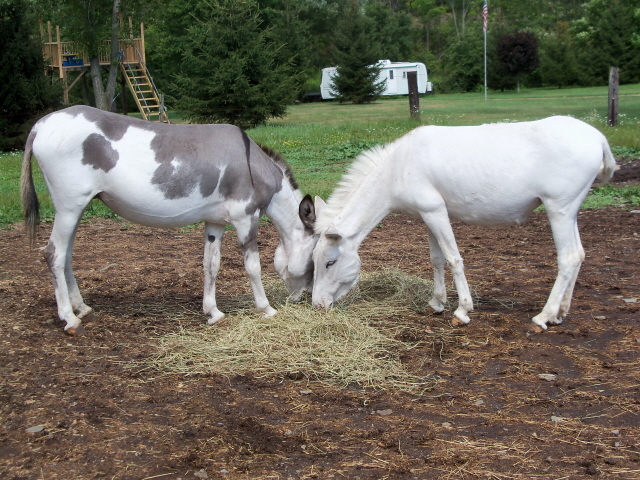 Gunny (Gunsmoke) is about 3 years old and Harry is 1-1/2. I “adopted” both of them from Linda Marchi at Seein’ Spots Farm near Los Olivos, California. She has many many more and I am so tempted every time I visit. We bought Harry as a 4-month-old so his mama, Flower, came along for a few months while we weaned him and he grew up a little. They are FUN FUN FUN! Don’t they just make you want to melt? Incidentally, Denise’s sister is Di, The Blue Ridge Gal. Hi, Di! There’s an adorable baby picture of Harry on Di’s blog. Check it out here. Second, from Mel in N.Y., we get to meet Toby’s and Tyler’s mammas! Here are the proud mothers of Toby and Tyler. Sparkle, (gray spot) and Shyann (more often called Attitude Ann around here). Shying for two reasons, first, she is shy all the spots she is supposed to have, and two, shy is definitely NOT what she is, or ever has been!! Right from day one, she has believed that she was Queen, and every thing should be done just to please her. The day she was born, she rubbed against my legs and demanded that I pet her. 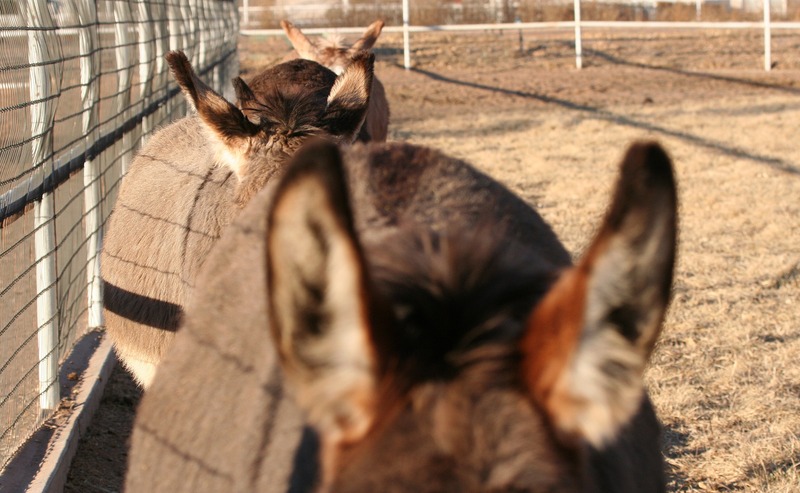 If I was paying attention to some other donkey, she would push in between us and say pet ME! When she was 11 months old, she decided it was time for her to take over being boss of the herd and by the end of summer she had become Number 2 boss! Sparkle, her mother, and number one boss, just will not give in to her! That was a fun summer! My first rule in having a foal each year was to sell the foals when they were weaned. I broke that rule with Ann. She was so much fun, I decided to keep her until she was old enough to have a foal of her own and then sell her. Now that time has come, and I find that I can’t let her go ! She is still fun, and I’m too attached to her! I was delighted to see this in my newspaper this morning and found it on the internet so I could share it with you. 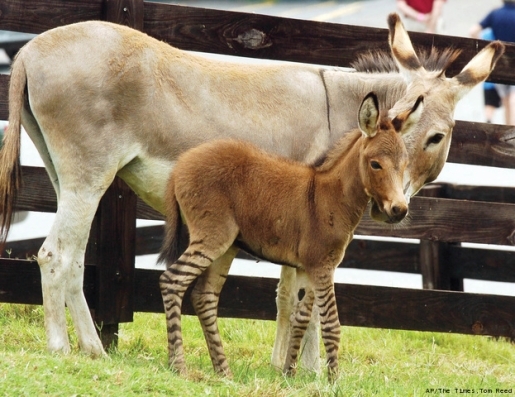 Apparently, when a zebra father has a baby with a donkey mother, the end result is what is called a zedonk. Read more about it here. 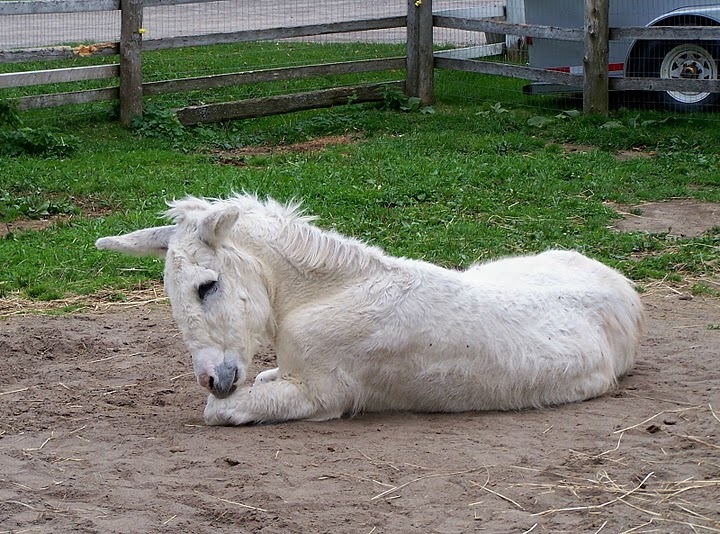 And thank you to Rosanne for more pictures of Russell, her mini donk. I begged, and Rosanne delivered! Russell is so cute. Here’s a photo of my little porker resting in the shade. It’s been hot and humid here since the monsoon started. Look at that sweet boy. It’s easy to see that Russell is so well-cared for and loved. 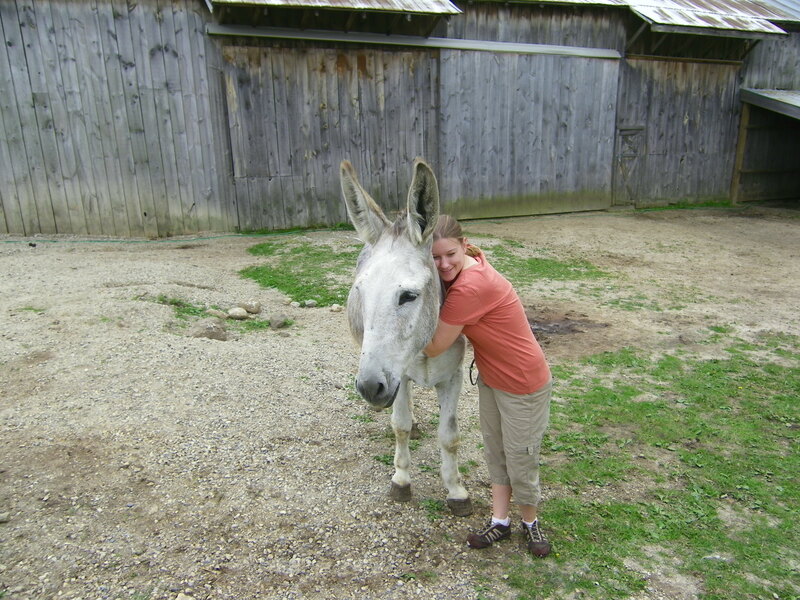 As much as I love my horses – I can’t imagine my life without a donkey! Our little Russell came to us when he was nine years old. He has been a wonderful addition to our family. Here is a picture of Russ getting ready to roll. And, Linda with her mammoth jennet, Sam. Sam is the love of my life. 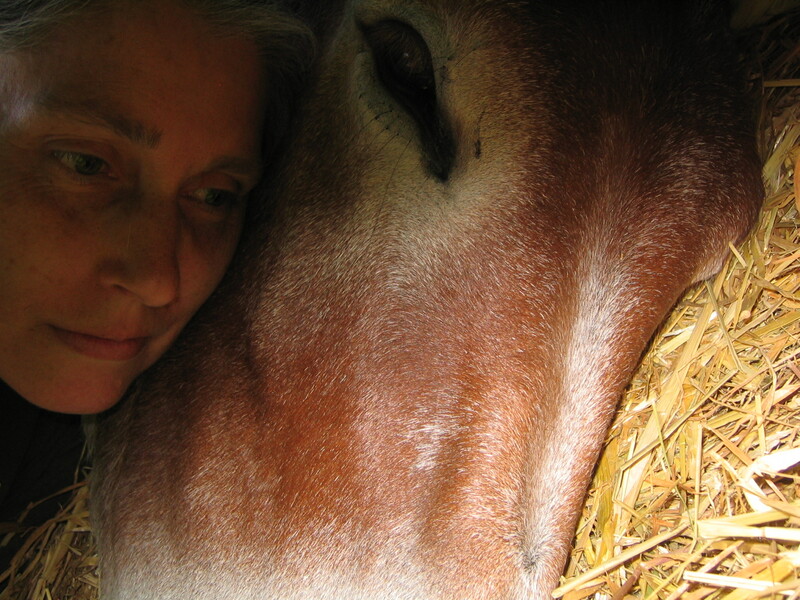 I’m lying down in the hay with Sam, something I do often, cuddling in various ways. I know that’s unusual because no one would do that in a pasture or the normal stall bedding. Sam has free choice hay, that’s why I have all that as bedding. Also I think because I have just the one, which most people think is wrong, I can be with her without distraction of other donkeys. She can totally relax with me. I can tell when she’s dreaming! 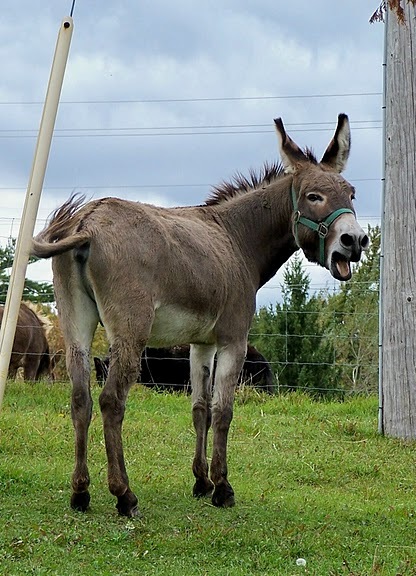 Maybe a subject for a later post: I was wondering how many words you think your donkeys understand. I’m amazed at what Sam knows. She knows body parts – I ask her before wiping her eyes, and I can tell by a slight blink she knows what I’m saying. She knows the words ears, neck, head, and tail, and of course feet. She knows words for food treats – strawberry, apple, blackberry, peach, carrot – and the general “do you want this?” When we go for a walk I can point to something I think she might like to eat and she’ll check it out. I trim Sam’s hooves myself – while she reclines! Mani-pedi day should be relaxing after all. Sam is extremely large even for a mammoth. She turned three in May and is 15.3 at the shoulders and 16.1 at the top of the hip. The bigger they are the more years they grow, perhaps up to their last new teeth at seven, so Sam may one day be the world’s tallest jennet! To see baby pictures of Sam and learn a little about Mammoth Jackstock, click here. Note from Morning Bray Farm: You’re going to love these pictures. We especially love the picture of Linda and Sam called “Smile and Say Alfalfa.” Oh, and definitely the one called “Eight Days Old.” We’re totally in love with Sam now. Check it out. 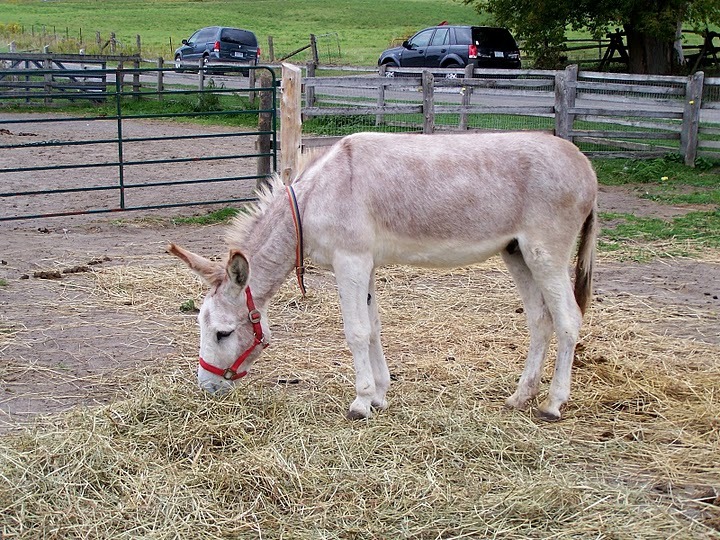 The American Donkey is one of the most misunderstood and often the most mistreated animal in our society. Improving the plight of these incredible animals begins with knowledge. I realize now this is so true. It’s shocking how different life was for Don and me only a year ago… BD; Before Donkeys. I’m ashamed to admit it, but I will. While I would never mistreat any animal, I bought into the “beasts of burden” thing. 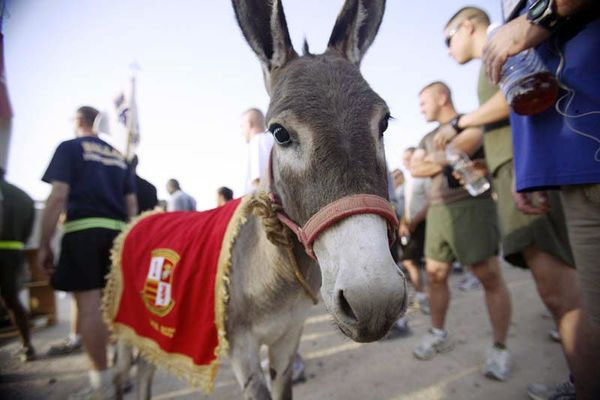 I never gave donkeys a second thought. I thought they were stubborn, I didn’t think they were intelligent, yadda, yadda. 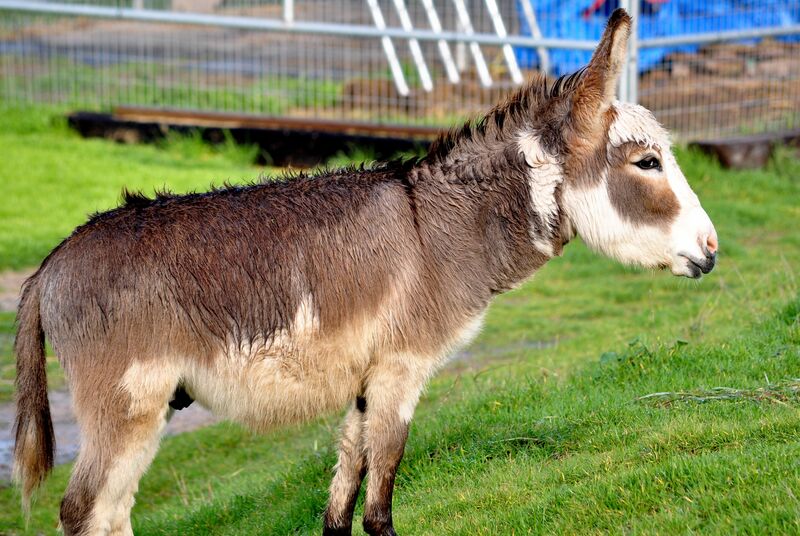 I mean, after all, why would so many people treat donkeys the way they do if donkeys were smart, willing creatures? We know differently now, and so do many of you. 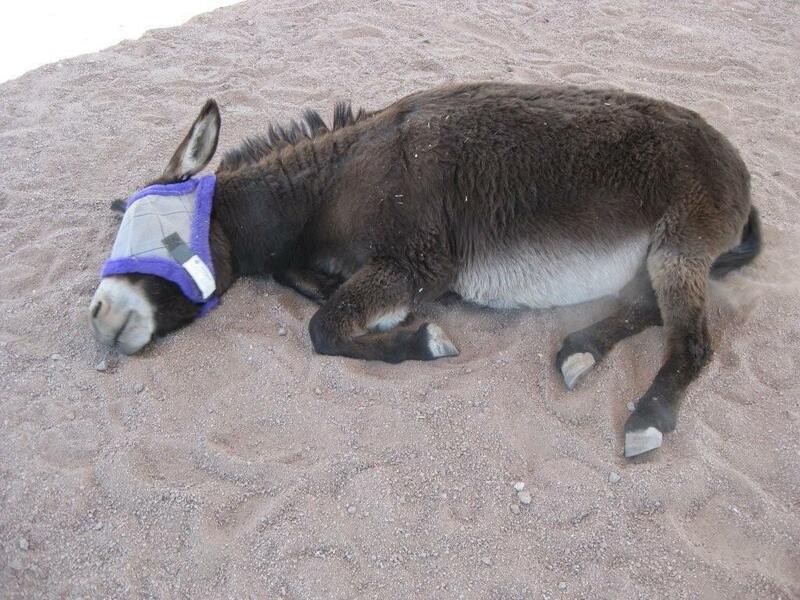 That’s why we’re starting a new page on our site called, For the love of donkeys. 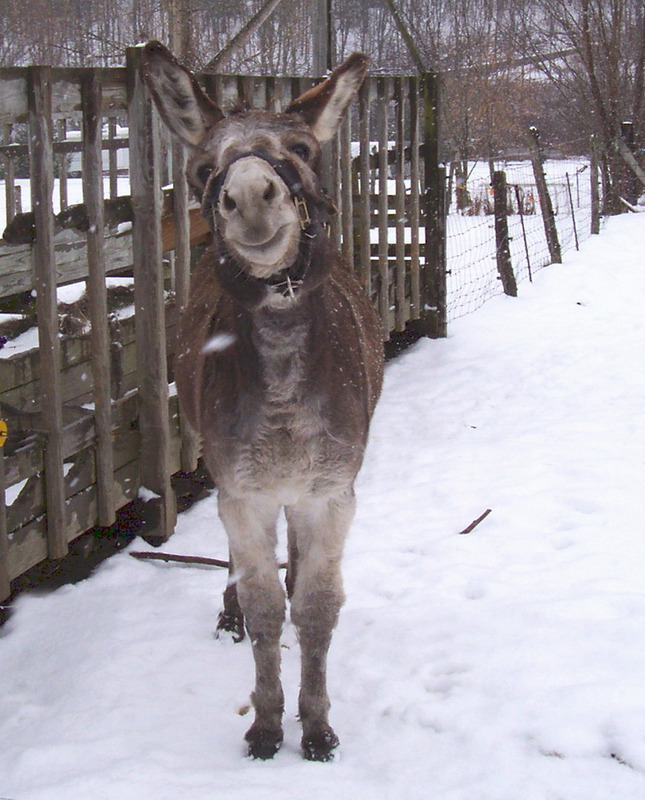 Our hope is that you’ll share your positive stories, experiences and photos of donkeys and burros. Just send them to us at morningbray@hotmail.com and we’ll post them. We’ll see what evolves from here. 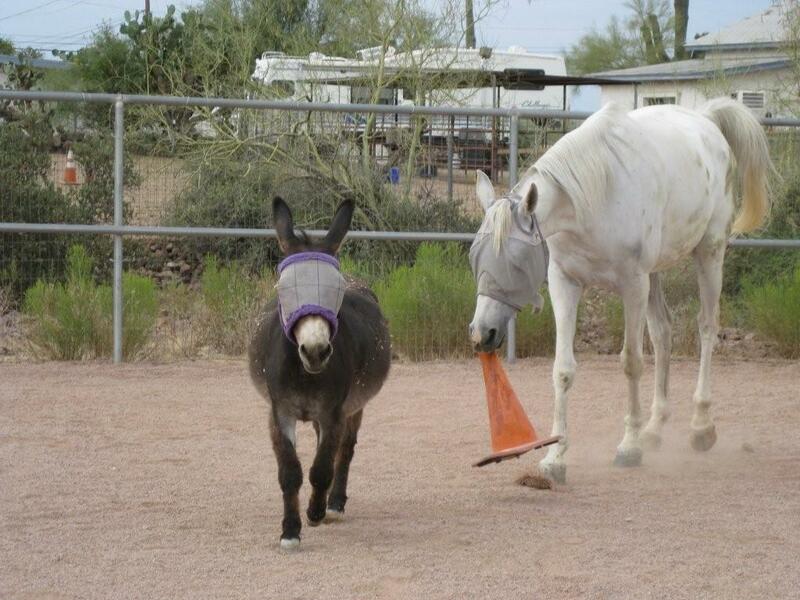 For our inaugural For the love of donkeys post, we’d like you to meet Toby and Tyler. Just look at them! Thanks so much to Mel in N.Y. for sharing them. Mel and I emailed back and forth yesterday about our love for donkeys. 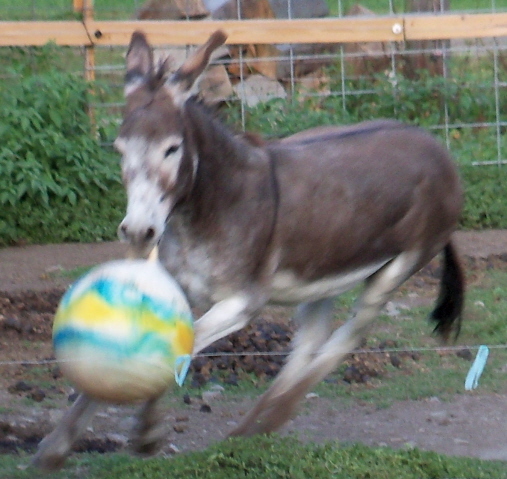 You know how much fun the big donkeys are, the babies are just that much more fun!! 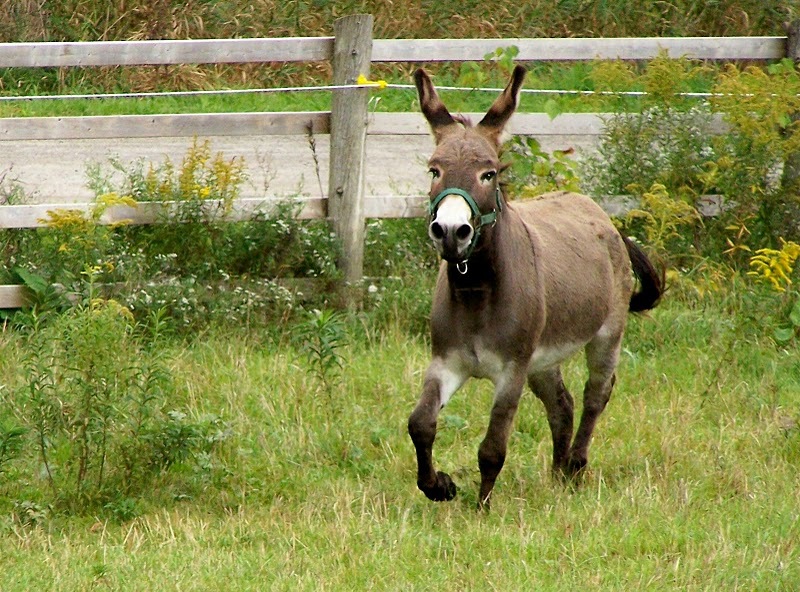 You must know by now just how contagious donkeys are. You can’t just have one or two, or three or four, 6, 8, LOL. Toby and Tyler are now 6 and 11 weeks old. In the picture they were 3 and 8 weeks. I’m still waiting for you to give Nigel a hug from me. Whats her ear spread ? I’ve met two mammoths with a 33 inch spread ! Sam has ears that measure 34 inches, from the tip of one ear down across her head up to the tip of the other. Unbelievable, for the love of God I should say they are treat to my eyes! 🙂 awesome post. Thanks for sharing. 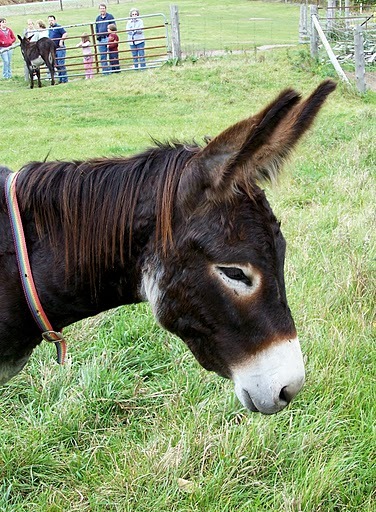 They are adorable and my favourite domestic animals… that zedonk is so darn cute! So much happiness and laughter here. I do love it. Just signed up. hi my friend and i are active supporters of “the donkey sanctury” a world wide organization devoted to the welfare and care of donkeys. we stumbled across your page by happy accident…love it. Omigosh, Toby and Tyler are such sweeties! Glad to have just discovered your blog. Lovely donkeys and very blessed to have such angelic humans to care for them.